Palo Duro Cutting Horse Association. Wyatt Lewis receives his buckle from dad Tyler Lewis. 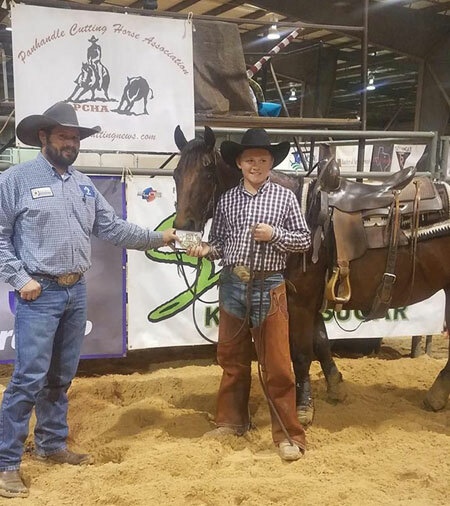 Wyatt marked a 72 to win the buckle class on Sat. night, riding Shortys Lil Cat, owned by the Lowrance Horse Division of San Antonio, TX. Palo Duro CHA & Panhandle CHA are once again joining together to offer Jeff Smith saddles in all classes. You must show in 60% of all shows produced by Palo Duro CHA & 60% of all shows produced by Panhandle CHA. Lee Ann & Cheryl will be happy to accept your donation in any amount.